**Wrapping paper will take approximately 4 to 6 business days in print production once your order is placed. Please make sure to select the best shipping method at checkout. Thank you! 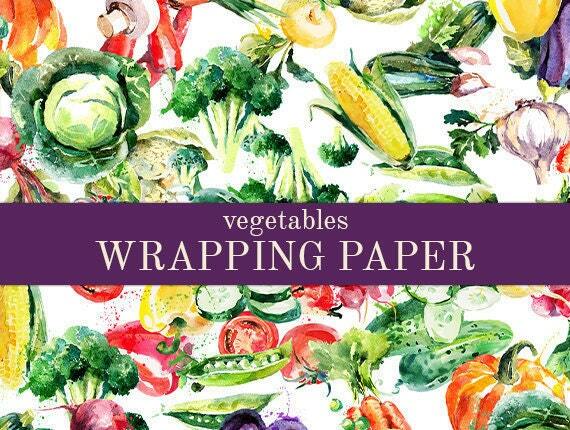 Vegetables Wrapping Paper | A Varitey Of 20 Vegetables In Watercolor Style | Gift Wrap In Two Sizes Great For Any Occasion. Made In The USA. Image shown is a 1ft x 1ft sample likeness of the actual printed wrapping paper. Each vegetable is approximately 3 inches in size. Luxurious matte gift wrap on a 9 foot or 18 foot roll of custom watercolor vegetables wrapping paper for all occasions. The other side of this wrapping paper is white. This wrapping paper is not found in stores and is printed onto white wrapping paper before shipping. This wrapping paper is thicker than standard department store gift wrap. **COUPON** Get free standard shipping when you purchase two or more rolls of wrapping paper in a single purchase. 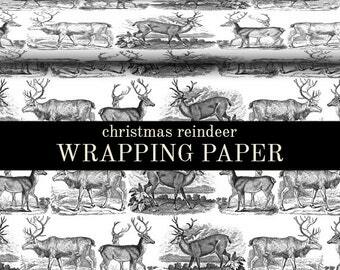 Each wrapping paper order is custom printed upon purchase and for this reason custom wrapping papers are final sale. * NOTE: Every computer monitor is calibrated differently and the color(s) you see on screen may not look exactly the same when printed. Enjoy your custom wrapping paper! This is my second roll of this paper. It is such a nice weight, and lots on the rolls. This is my signature wrap for all my gifts! Love it! Botanical Wrapping Paper Roll | Colorful Botanical Abstract Vintage Pattern Gift Wrap In Two Sizes For Everyday Gift Giving..